Whats new in Historic Old Town Park City real estate? One of the areas in Park City where there is value being created by scarcity is Old Town. In the span of years from the mid 1800s until now most of the lots have been built on. In a typical real estate cycle homes will age and then be torn down to develop new product. The difference in Old Town is that there are a significant number of structures on the Historical Register and these cannot be removed to build new structures. These structures include homes, sheds, garages and even chicken coops. Depending on the historical designation many of these structures cannot even be moved. This is why new construction in Old Town is so valuable. That being said there are some exciting new construction opportunities in Old Town Park City. This redevelopment of the Main Street Mall is nearing completion. Located on upper Main Street these 15 condos located in the heart of Old Towns Historic District is a must see for Park Citys luxury buyer. For more information or to view available listings click The Parkite. There are only three condominium subdivisions contiguous to the Town Lift Plaza ski lift and 820 Park Avenue, which is nearing completion, will be the newest most luxurious of the three. All ten of these condos are under contract. There is a s home on King Road that is under construction with an undetermined completion date. It will be between 1800 and 2100 sf and have three bedrooms and three baths. There is a possibility that there will be a basement added but at this point we are unsure. A recent sale of a home on Sampson In the historic district that had all of the bells and whistles. There was no detail over looked. This home had 5 bedrooms and 5 bathrooms with a total sf of 3,870. This home sold at $4,000,000 for a per sf price of $1,034. There are other homes and condominiums in the design or construction phase. To find out which home might be the best fit for you or to determine the value of your property in Old Town contact the YouInParkCity.com Group at KW Park City Keller Williams Real Estate (435)962-9472. Posted in buyers, Park City Neighborhoods | 0 Responses to "Whats new in Historic Old Town Park City real estate?" Much more than one of the Best Golf Courses in Utah. 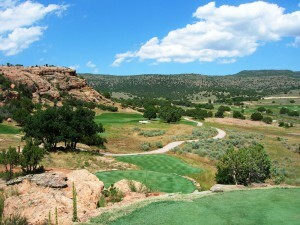 If youve read up on Victory Ranch through YouInParkCity.com you are aware that we consider the golf there one of Utahs Best; a recent excursion reminded us that it is so much more. Changes at Victory Ranch recently have made great enhancements to the outdoor lifestyle and the community feel of Victory Ranch. The 350 residences nestled around the golf course are bordered by large open spaces (Victory Ranch covers 6700 acres). Construction within the community include new golf cabins with spectacular views. River Cabins that can be used while you are building or as over-flow for your guests, are well appointed with a feel of being away from it all just outside your door. The Post is well on its way with framing complete and construction workers feverishly moving forward, the building will be the centerpiece for member activities including gym facilities, an outdoor pool, lunch to go and gathering spaces. New this spring was the addition of the Ski-in/Ski-out Clubhouse for Victory Ranch Members at the base of the Town Lift on Main St in historic downtown Park City. It is a perfect before and after ski locker space and lounge area. Over 4000 of Victory Ranchs 6700 acres is designated as Backcountry set aside for exploring on foot, horseback or in four-wheel drive ATVs. More than 20 miles of mountain bike trails run through the Backcounty; easily accessed on the complimentary full suspension or fat tire mountain bikes. The Double Barrel is a 5-stand shooting facility with 5, six clay target launchers and experienced range masters can make even someone that has never handled a shotgun feel comfortable and have fun. Victory Ranchs location along the Upper Provo River has always been one of the things that differentiated it from other second home options in and around Park City, Utah. Its four miles of private world class fly fishing truly sets it apart. Stocked ponds on the property offer a perfect introduction to the sport. Our most recent outing at Victory Ranch courtesy of its year-round concierge and activity guides gave us an overview of its amenities that reinforced our feeling that this is a truly special private community. Not all ownership opportunities are listed across the MLS and there are new river view and golf view homesites that we feel are great opportunities. For more information and a tour of Victory Ranch contact YouInParkCity.com. 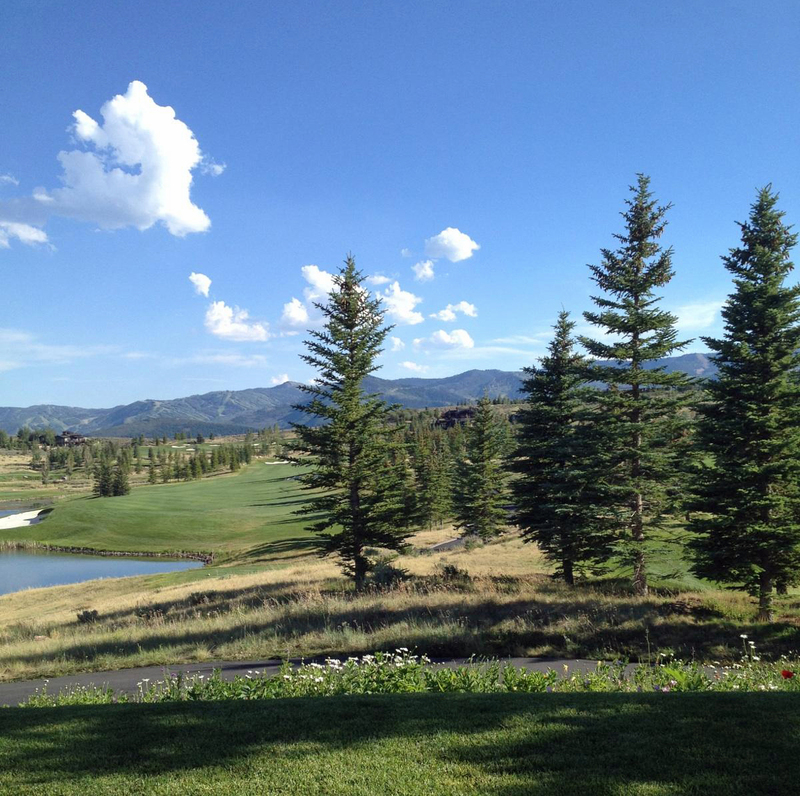 Posted in buyers, Park City Golfing, Park City Neighborhoods | 0 Responses to "Victory Ranch Revisited"
Half-way 2014? Yes, we are now just over half way through the ski season for 2013-2014. And it is time to look at how real estate sales are shaping up in Deer Valley and Park City, UT. So far for the 2013-2014 ski season the greater Deer Valley area Lower Deer Valley, Upper Deer Valley, Deer Crest and Empire Pass) has seen 23 sales. The sales include 1 building lot, 17 condominiums and 5 single family homes. These numbers are way down when compared to the 41 sales for the same period last ski season (8 lots, 25 condos and 8 homes). In terms of snowfall and ski season visitors, the season has been very similar to last year. So what has changed? Inventory: Inventory levels have changed in multiple ways. The amount of inventory on the market to choose from has diminished. There are currently 64 homes, 158 condominiums and 33 building lots available in the greater Deer Valley area. Many of the homes and condominiums for sale are in need of updating. The quick reservations that were put in on the Stein Eriksen Residences show that the market is ready for new contemporary finishes (although some of these reservations are likely speculative purchase reservations). Pricing: Prices are rising quickly on the more affordable condominiums in the area (possibly beyond what the market will bear) and nearly 70% of the available condominiums in the Deer Valley area have asking prices over $1M. Pending Sales: There are currently more pending Deer Valley real estate sales than there were sales in the past two months. If these sales all close, the number of sold units in Deer Valley will be much closer to that of the 2012-2013 ski season. When I spoke with a few other area realtors about the Deer Valley real estate sales stats for the ski season so far, a few offered that the impact of Vail running Canyons Resort may be having an adverse impact on Deer Valley sales. The sales stats show the Canyons area to be flat compared to last year, so there has been little to no impact yet from Vail Resorts taking over operations at Canyons. When taking everything into account, homes and condos in Deer Valley are selling. The options that are well priced and updated move quickly and while prices are increasing due to lack of inventory, the jump may not be as rapid as some Sellers would like. For more information and assistance in Buying or Selling a Deer Valley or Park City property contact a local real estate professional at YouInParkCity.com (888)968-4672. Posted in buyers, Park City Economy, Park City Skiing, Park City value, sellers | 0 Responses to "Deer Valley Real Estate Sales Half-Way 2014"
The first three quarters of 2013 are now in the books (it is hard to believe that ski season is only a month away!). Park City real estate sales for the first 3/4ths of the year have been very strong. Sales volume is up and so are prices while inventory is down. Single family home sales in the greater Park City area are up eighteen percent (18%) when compared with the first three quarters of 2012. The median sales price of Park City, UT homes sold in 2013 is up by over $60,000 to $810,000 (half of the homes sold for above this price while half sold below this price). Inventory levels continue to be a big part of the story. Single family home sales under $500K have a current less than 3 month supply while homes in the $500-750K category have less than 4 months supply at current sales rates. Luxury homes still a have large number of for sale options but sales of homes over $2M were up by 30+ percent versus the first three quarters of 2012. Over 40% of the sales so far this year have had homes on the market for less than 30 days. Good values still exist in the market, but Buyers need to be ready to move quickly. Condominium sales in the greater Park City area had similar gains to single family homes in the area. Sales volume is up by eighteen percent (18%) while the median sales price has risen by over ten percent (10%). Current sales volume has an absorption rate of only 4 months for condominiums under $250K while there is a nine (9) month supply in the $500-$1M price range. Even the luxury condominiums valued at $1M or more only show a one year supply at the current sales rate. Building lot sales in greater Park City also experienced dramatic increases with sales up over fifty percent (50%) and median prices up by ten percent (10%) to $323,500. By adhering to the idea that the value of a homes lot should be twenty to twenty five percent (20-25%) of the value of the home, the median value of the new homes to be built on the recently purchased lots should be in the $1.3M to $1.6M. Mixed into all of the sales in Park City over the past nine months there are of course areas that have not experienced the same increases and a few that have had values drop. For a comprehensive analysis of the Park City real estate market segment that matters to you contact a realty professional with YouInParkCity.com today. 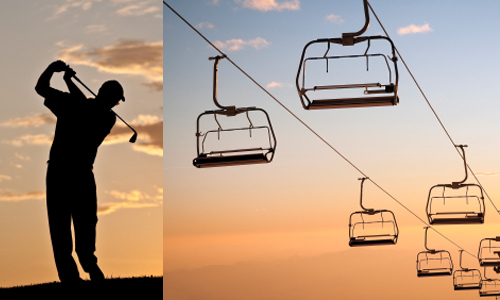 The Promontory development of Park City, Utah bills itself as a four-season resort with activities and amenities geared toward year round use, but its two golf courses place it firmly in the golf community real estate category for the summer months. The Promontory community has weathered the downturn and financial crisis well and could be said to actually have benefitted from it in certain aspects. Promontory is without a doubt the most amenity rich option of the social club and golf communities in the Park City, UT area. The amenities they offer and the scope of their membership opportunities have grown each year. Golf Digest for 2013 ranked the Dye Canyon Course as #3 in the state followed by the Nicklaus Painted Valley course at #4 in the state. The Pete Dye designed Canyon Course also was named as #48 of the top 100 public golf courses by Golf Digest. Real estate sales at Promontory show similar numbers for the past 12 months as the preceding 12 months, but there is a different feel. Pricing of the sales is up. The median sales price on building lots is up 20% and the median price on sold homes is up 15%. The number of distressed sales at Promontory has dropped dramatically. The last 12 months shows 16 sales of homes for a price of under $300 per square foot while the previous year had 27 such sales in the same number of total sales. There are currently 6 offerings on the Park City MLS in Promontory for under $300 per square foot of the 55 active sales. The recent sales data at Promontory has been strong enough that the developer (The Pivotal Group) is beginning to re-introduce developer owned lots as well as increasing their cabin home offerings. Developer owned lots and cabins at Promontory can include memberships and delayed or deferred social club and golf fees which need to be considered as part of the Promontory amenities, so not all purchase prices are equal. Non-golf related developments are a huge contributing factor to the value at Promontory. The Shed which opened last year has been a huge success. This years new additions include a dog park athletic and social club refurbishing and an additional pool. Most noticeable are the $1M spent by the Promontory Conservancy on trees. With the total development still being less than have done and still a large number of resale opportunities; there is quite a bit of territory and many options to consider. For a tour and assistance in navigating the options at Promontory contact a golf realty specialist with YouInParkCity.com at (888)968-4672. Posted in Park City Golfing, Park City Neighborhoods | 0 Responses to "Promontory Golf and Real Estate Review"
Vail brings with it a large marketing presence and a huge database of skiers and snowboarders. Recently the resort operator has been shifting its model to focus efforts on resort revenue rather than real estate development. One of the main focus points of this effort is the Epic Pass. Vail Resorts will include Canyons in its Epic Pass program which offers skiers and snowboarders unlimited access to Vail, Beaver Creek, Breckenridge, Keystone, Northstar, Heavenly and Kirkwood all for $689. The impact of this should be huge for Canyons which saw 450,000 skier days last season. The pass is sold to not just locals, but to skiers and snowboarders worldwide (last year saw buyers from 70 different countries). Anyone looking to ski a week at one of Vail Resorts operations can cut their vacation costs by purchasing an Epic Pass and open up the opportunity of skiing in Colorado, California, Utah, Austria and Switzerland all on one ticket. Go to Snow.com/epic-pass for more. The impact of all the Epic Pass holders having essentially free lift passes at Canyons Resort as an added bonus to their pass purchase will undoubtedly bring more skiers and snowboarders to Park City. Home and condominium owners in Park City already know about the easy access and great offerings that are here, but this will open the area up to a whole new set of visitors. The added exposure to Canyons Resort and Park City will lead to increased demand for local real estate and drive up prices as well as add to the rental revenues of current owners. There are many factors to real estate prices and we dont have a crystal ball to see the future, but what Vail Resorts brings to Canyons and local Park City real estate should only prove positive. Posted in buyers, Park City Skiing, Park City value, sellers | 0 Responses to "Canyons Resort Real Estate Prices and Vail Resorts"
The Jack Nicklaus signature course at Red Ledges just seems get better every time we play it. In 2010 and 2011 Golfweek Magazine ranked it as Best of State and we think it is certainly in the top 3. There were no major changes made on the course last year. The reworking of several of the greens that was done a few years ago to make those greens more receptive and hold shots has paid off. The bent grass greens have had a couple of growing seasons since the alterations and they are rolling true and holding good shots. Red Ledges, one of Park City Real Estates premier golf communities, sold 48 properties in the in the past 12 months. For the same time period last year there were 36 sales. This shows a very healthy improvement. Part of what we see as very encouraging (for Park Citys golf community market) is that 10 lots were sold to smaller builders who intend to break ground on spec homes. New homes being built and in the planning stages is yet another sign that the Park City Real Estate market is turning the corner. Another positive indicator that Red Ledges is healthy is that a new neighborhood is breaking ground. It is called Mountain View. Mountain View will offer 4 models that will be priced in the $500,000 to $700,000 range. Red Ledges is differentiating itself in Park Citys golf market by offering homes in more price ranges than the other golf communities. With a few lots still available for under $200,000 and single family homes starting in the $500,000 range Red Ledges has with increased their pool of buyers compared to the other Golf communities. Golf or lifestyle memberships are currently included in developer sales but we expect that to come to an end soon. Red Ledges amenity package now includes the Jack Nicklaus 18 hole championship signature course, a comprehensive practice facility, the Jim McLean Golf School, the Cliff Drysdale Tennis academy, a golf shop, and swimming pool and equestrian programs. The most exciting news is that they will be breaking ground on the Clubhouse next month. The current goal is to have all of the planned amenities in place in the next 5 years. For more Red Ledges real estate information or for a tour of the community and facilities contact a realty professional with the YouInParkCity.com Group at (888)968-4672. Posted in Park City Golfing, Park City Neighborhoods | 0 Responses to "Red Ledges Golf Real Estate & Community Update 2013"
Glenwild is without a doubt one of the best golf courses in Utah and a premier Park City real esate area; in 2006 the course was rated as Best in State by Golf Digest and it has remained at the top of lists ever since. It should, without a doubt, be on your list if you are considering a second home in one of Park Citys golf communities. 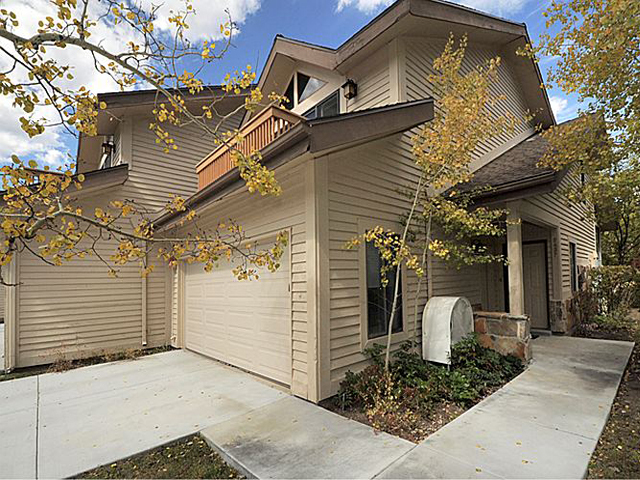 Located only 20 minutes from downtown Park City or Salt Lake City it should also be a consideration for families wanting to live in Park City who commute to Salt Lake. The par 71 championship course was designed by Tom Fazio and plays up to 7451 yards from the tips but with four tee boxes there is enough variation in yardage for players of all abilities to enjoy the experience. Last summer the greens, which are perfectly manicured, stimp as high as 12. Now to Glenwild real estate. Of the 200 luxury homes and home sites at Glenwild there are 12 homes and 12 lots for sale currently. In the past 12 months there were 7 Glenwild homes sold. During this time 20 lots sold. The average price per square foot of the homes sold was $378 while the average for homes for sale is $419 per square foot. The active buyers in the Park City Real Estate market seem to be saying that they are willing endure the building process unless the price of an existing home is very compelling. The YouInParkCity.com group, as a member of the Builder Services division of Keller Williams Park City Real Estate works with many of the Park City builders and has access to a wealth of information regarding building trends and costs and what buyers are saying makes a lot of sense. At the builder service practice group we leverage these contacts and information to help ensure the design build process goes smoothly for our clients. What makes Glenwild unique among Park Citys 5 golf communities, in our opinion, is that it offers a more intimate setting than most of the other golf developments which are substantially larger. The amenities which, in addition to golf, include an exceptional trails system, state of the art spa, spacious swimming pool, tennis courts, an elegant clubhouse and an inviting restaurant are sized to accommodate the limited membership. Glenwild is also the only gated golf community in Park City to offer memberships to people that dont own property in the community. There are currently 36 of the 325 memberships available. The price for a golf membership is $75,000 with annual dues running $12,000. Social memberships are also available for $15,000 with annual dues costing $6,000. For more information about the real estate opportunities and how the Glenwild community may fit your lifestyle contact a local realty expert with YouInParkCity.com at (888)968-4672. Posted in Park City Golfing, Park City Real Estate Notes | 0 Responses to "Glenwild Golf Real Estate Update"
Why do people buy country club memberships and why isnt there a ski oriented membership Park City real estate option? People buy country club memberships for many reasons but probably the primary motivation is the quality of the golf experience and the easy access to the course. People are also drawn to the social element of a country club and the many (non-golf) functions the clubs host which allow members to interact in a relaxing setting with their family, friends and peers. In Park City there actually are several ski oriented country club experiences which come in the form of interval or fractional real estate offerings. In my mind purchasing one these luxury ski condos offerings is very similar to buying an equity country club membership. 	You purchase your membership or condo and pay annual dues. 	When you want to do something different you sell your membership. Most golf clubs make you sell the membership through the club. They set the price and keep a portion of the proceeds. With a fractional or interval ski condo sale you generally sell it at market price and no proceeds are returned to the club. 	You pay dues to maintain the facilities, pay for staffing and market and communicate with members and the public who are the clubs future members. 	Just like country clubs there is no usually no financing available for a fractional or interval condo purchase. It is a luxury real estate purchase and an investment in lifestyle. 	Golf is included in country club dues. With the purchase of a Park City fractional or interval condo you get access to lodging. The number of weeks available and the reservation policies vary from property to property. 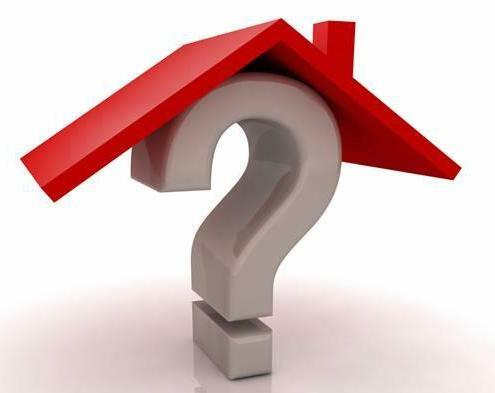 When buying a fractional mountain resort condo what questions should you ask? 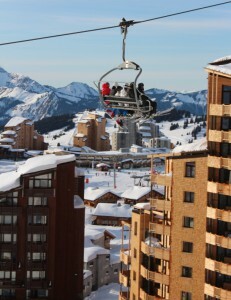 	Is the condo ski in ski out and what are the other winter activities will be provided? 	What summer activities are organized for you? 	Is airport transportation and in town shuttle service provided. You are looking for a hassle free experience arent you? 	What other amenities are within walking distance to the condo, i.e. restaurants, shopping, ski and bike rentals, etc.? 	What are the other owners like? 	What level of service are you expecting? What is the staff like? Are they knowledgeable about the property and the community? Are they friendly? 	What do you own and how is ownership conveyed? 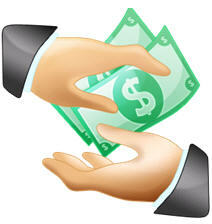 	Are property taxes paid as part of your dues? 	If you arent going to use one of your weeks what can you do with the condo? For expert information on these fractional or interval ownership condominiums or any Park City Real Estate information contact the realty professionals with the YouInParkCity.com Group at (888)968-4672. 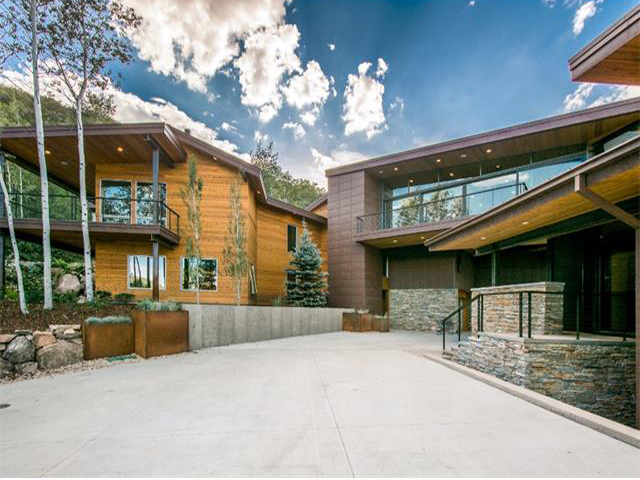 Posted in buyers, Park City Skiing, Park City value | 0 Responses to "Ski Resort Country Club Park City, Utah"
Two appraisals of the same Park City home result with a large dollar discrepancy. A buying client of the YouInParkCity.com Group was set to purchase a home and was paying cash. Even though it was technically unnecessary, we felt that an appraisal of the home would be good for everyones peace of mind ensuring that the second home they were buying was a good value. With the cash purchase, we were on a short timeline and our first choice of local Park City appraisers was on vacation. We asked around and got a few good recommendations for another qualified local appraiser. The buyers asked that the appraisal be made without the appraiser knowing the contract price of the home. The appraisal came back at approximately 10% below the agreed upon purchase price. Upon getting the appraisal, the Sellers agreed to pay for another appraisal (feeling that this one was incorrect). For the second appraisal, the Sellers gave the appraiser (another respected local Park City appraiser) a copy of the Purchase Contract. This time the home appraised at the contracted purchase price (10% above the previous appraisal). We asked both appraisers about their findings. Both stood behind their appraisal values for the home but there were some interesting differences. Most of the homes used as the comparable sales were the same. In looking at the two appraisals and the adjustments made for the same subject property values of the same item were very different. While one gave a $2500 adjustment for A/C, the other valued it at $5000. A fireplace was valued by one appraiser at $4000 while the other valued it at $2500. One placed a dollar value on the hot tub while the other considered it personal property not attached to the home and gave it no value. The largest discrepancy between the two appraisals was the adjustment for size; one gave a $30/sq ft adjustment versus a similar home (same number of beds, baths, kitchen, etc.) while the other valued the added space at $70/sq ft. This difference was magnified by the 100 sq ft difference between the two measurements stated in the appraisals. Which one of the appraisals was correct? As it is with most things, it depends upon which side of the transaction you are on. I believe that the value lies somewhere in-between. Posted in Uncategorized, buyers, Park City value, sellers | 0 Responses to "Park City Home Value Appraisals"
Are Buyers Paying Asking Price for Homes in Park City? How much off the list price can I expect to pay for Park City Real Estate? We live in a time when everyone wants a deal and consequently people dont want to pay the asking price for just about anything. Discounts flood our email in-boxes, coupons fill the mail and newspapers are delivery vehicles for weekly sale circulars. It has gotten to the point that we readily know that full price isnt what well pay in the end. There are of course some exceptions; we know the price of an iPad will be the same wherever we buy it and there wont be any discounts, and we dont wait to go to Starbucks until the coffee is on sale. 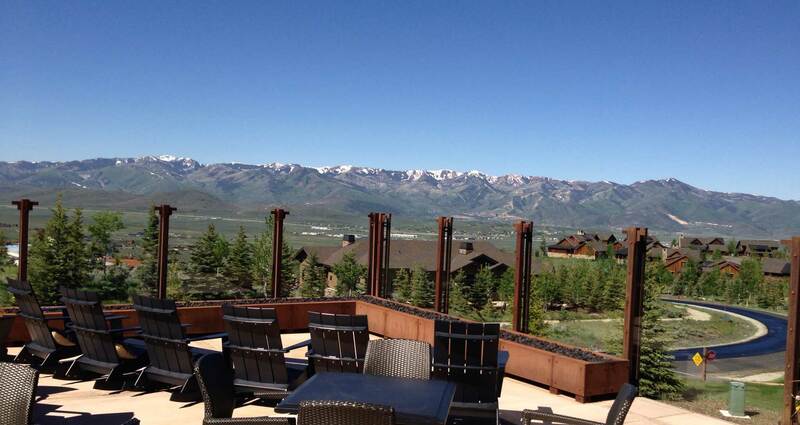 What about houses and condominiums in Park City, UT? Are people paying full price or is everything on sale? Over the past 90 days there have been 228 sales registered across the Park City MLS. Of these sales, 36 recorded at or above the asking price. Over 15% of the sales were full price or more. Moreover over half of the transactions recorded with a sales price of 95% or more of the asking price. In terms of a retail sale, a 5% off banner wouldnt turn any heads. What happened to the big discounts? Only 39 of the 228 real estate sales in Park City were discounted by more than 10%. This isnt necessarily an indication that people are willing to pay full price, but rather that people are willing to pay for value. If full price is less than a comparable recent home sale and/or if the home or condo is better than other options or part of a limited supply, asking price can be a good value or deal. Interestingly, not all of the sales that were not discounted moved quickly. Nearly half of the sales that show 5% or less discounting from their original price had been on the market for over 90 days. Your YouInParkCity.com Group real estate professional can help you determine if a Park City or Deer Valley home or condominium is on sale and a value in our current market. Call us at (888)968-4672 or email info@youinparkcity.com to discuss current area home values. Posted in buyers, Park City Real Estate Notes, sellers | 0 Responses to "Are Buyers Paying Asking Price for Homes in Park City?" Park City, Utah has seen its share of distressed real estate sales in the past 2 years. A look at the sales statistics from the Park City area MLS reveals that distressed sales have made up 25% of the total sales of homes, condominiums and land in the Greater Park City area in 2010 and 2011. The sales of bank owned properties have far outpaced the short sales (more than 2 to 1) and 2011 saw a smaller percentage of distressed sales than 2010. 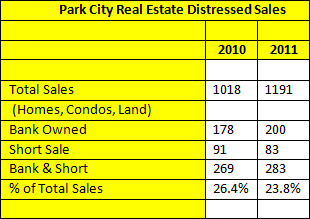 The number of distressed for sale real estate listings in Park City has been steadily decreasing. People looking to buy bank owned properties in the Park City area are increasingly encountering multiple offer situations and sales prices are often higher than the listing price for bank owned Park City properties. The sales of bank owned in relation to the number available is an indicator of how quickly they move. The number of short sales completed is an indication of how hard they can be to complete. Also of note is that half of the current short sale supply has offers awaiting bank approval. Buying distressed real estate in Park City is possible, but there can be many pitfalls and the competition can be fierce. For more information about real estate sales in Park City, Utah contact a Park City realty professional with YouInParkCity.com at (888)968-4672. Data and sales information from the Park City MLS deemed reliable but not guaranteed. 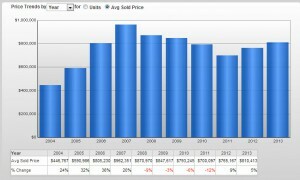 Posted in buyers, Park City Real Estate Notes, Park City value | 0 Responses to "Distressed Real Estate Sales in Park City, UT"
We are close to having one year of sales data for the Montage at Deer Valley and the sales data shows surprising strength given the overall market and world economy. Thirteen sales have been completed for Montage Deer Valley Residences. The sales represent just over 15% of the available units but were nearly 50% of all sales in Park Citys luxury real estate enclave of Empire Pass. Sales prices have ranged from $1.6M to $8M. The latest release of residence models at Montage Deer Valley will feature a showcase residence that is a collaboration between interior designer Philip Gorrivan and One Kings Lane (a leading online site for designer décor, furnishings and accessories). The 3471 square foot home is a two story three bedroom, three bath model featuring a large great room, dining room, gourmet kitchen, and den. Three private balconies offer incomparable ski resort and valley views. The designer elements in the home have created a mountain modern feel in which each room has its own unique sense and appeal to the luxury Park City lifestyle. Our recent tour through this home was impressive. The home will enjoy access to all of the Montage Deer Valley spa and resort services and amenities; not the least of which is its slope-side Deer Valley location. 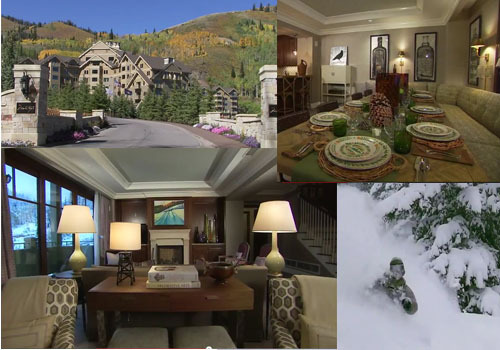 For more information about this special Montage Deer Valley home or a private tour focused on luxury Park City and Deer Valley real estate contact YouInParkCity.com at (888)968-4672. Posted in buyers, Park City Neighborhoods, Park City Real Estate Notes | 0 Responses to "Montage Deer Valley Real Estate"
With 45 days left before the end of the year, we probably wont see significant changes in Park City real estate sales totals. Current for sale inventory in Park Citys Lower Deer Valley area includes 28 single family homes and 54 condominiums. This number will likely rise slightly as we move closer to the ski season. To date there have been 7 single family home sales this year and 2 other homes have accepted sales contracts. So the inventory levels indicate a 3-4 year supply of single family homes in the Lower Deer Valley area. The inventory varies greatly with offerings ranging from $775k to just over $3M. Lower Deer Valley has some homes that are beginning to show their age; this fact can be seen in the variations of asking price with the least expensive homes in the low $200s/square foot and the highest end well into the mid $500s/sq.ft. Single Family homes sales for Lower Deer Valley are likely to lag 2010 numbers by nearly 30%. Condominium sales in the Lower Deer Valley area of Park City show a strong increase versus 2010, but there are factors that have skewed this number dramatically. To date 49 condominiums have sold in Lower Deer Valley and another 6 have pending sales contracts. With 53 active for sale condominium listings, the current inventory represents just over a one-year supply. Lower Deer Valley condominium sales totaled 32 for 2010, so this years numbers at first blush are very strong. The twist is that 22 of the sales were bank (or corporate) REO properties. The sales of the bank owned condominiums had an average sales price in the low $300s per square foot. By contrast, the average sales price for non-bank owned properties was over $375 per square foot. Many of the homes and condominiums in the Lower Deer Valley area were built from the early 1980s through the mid 1990s and many of the properties are showing their age. The new construction in the past few years in the Empire Canyon area of Deer Valley has impacted sales greatly as buyers tend toward more turnkey products. The Lower Deer Valley area offers great access to all Park City has to offer and there are definitely gems to be found in the for sale listings. 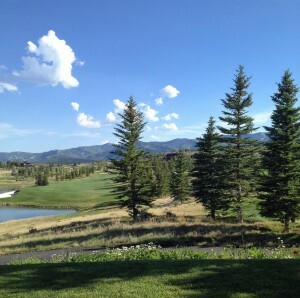 For information regarding specific realty listings in Lower Deer Valley, contact YouInParkCity.com at (888)968-4672. Posted in buyers, Park City Neighborhoods, Park City Real Estate Notes, sellers | 0 Responses to "Lower Deer Valley Real Estate 2011"
The Western Mountain Resort Alliance is composed of 13 destination ski resort area Boards of REALTORS®. The alliance was founded on the idea that while the resorts vary geographically, they share many of the same real estate and development issues due to their vacation resort status. 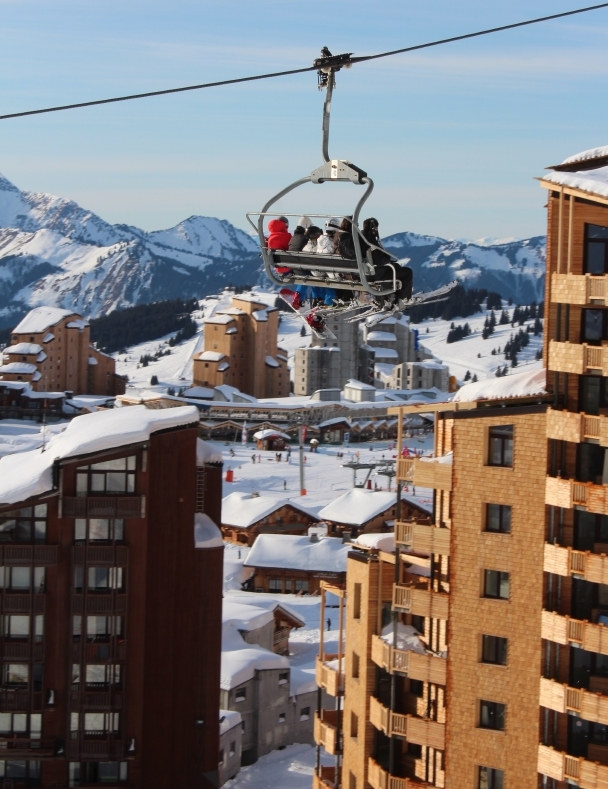 The alliance publishes quarterly sales statistics for the various destination ski areas. While we here in Park City, UT believe that our resort community offers some of the best recreational opportunities and easiest access of any Western North American Ski Resort, a look at what can be purchased in other resort towns can be very informative. Having spent 10 years in Vail, CO, I am jaded to believe that it is the resort with most in common to Park City. In terms of total available inventory if we exclude vacant land, the two areas are almost identical although the single family homes versus condominiums is reversed with Park City having nearly double the number of single family homes on the market as Vail. The number of units sold in the two towns shows Park Citys sales being up 18% in unit volume for the first three quarters of 2011 while Vails sales were relatively flat. Available inventory is down in both Park City and Vail versus 2010. The average sales price in Park City saw a 10% decline while Vail registered a 25% decline versus the same period last year. Another interesting comparison stat between Park City and Vail is the median sales prices. Park City area single family home sales saw a median price (half above and half below) of nearly $550K while Vail shows $400K. Conversely, condominium sales median pricing shows Vail at $480K and Park City at $325. Average sales prices for both single family homes and condominiums are considerably higher in Vail than in Park City. Maybe Park City and Vail dont have as much in common as I thought in terms of real estate and the associated values. This likely has a lot to do with the differences in terms of Park City having been an old mining town that developed ski resorts versus Vail having been a ski resort that developed into a town. For in-depth neighborhood by neighborhood real estate information about Park City, UT, contact a realty professional with the YouInParkCity.com Group at (888)968-4672. Posted in buyers, Park City Real Estate Notes, Park City value | 0 Responses to "Ski Resort Real Estate: Park City or Vail"
The March 5th, 2010 edition of Barron's PENTA ranked Deer Valley, UT as #6 among the top 15 places to own a second home. PENTA is a standalone quarterly pullout section of Barron's which focuses on individuals with $5M or more to invest. In considering the rankings Barron's focused "In seeking out and ranking these havens, we looked for beauty, comfort, convenience, a range of lifestyles and -- always the paramount criterion at Barron's -- value. We wanted prices that had clearly hit bottom and were either rising or ready to rise." The article also notes that "home prices in moneyed enclaves climbed more than 10% last year". The accolades are great; Deer Valley deserves to be named one of the best places in the country to own a second (or first) home. Deer Valley without a doubt ranks among the top spots in the world for the criteria of beauty, comfort, convenience and range of lifestyle opportunities. The Barron's article notes that the proximity of Park City to Salt Lake International Airport gives the area an advantage over other rocky mountain ski destinations. Reasons why Deer Valley and Park City, UT in general are worthy of these accolades are too numerous to list. The Barron's PENTA article goes on to name and include a photo of a home in Tuhaye as the place to be in Deer Valley. The article notes that sales in 2009 in Tuhaye were 0 while the median price for 2010 was $1.3M (there were 9 single family home sales shown across the Park City MLS for the area in 2010). 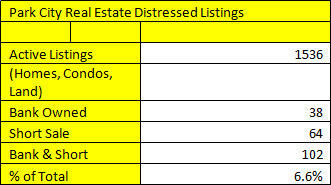 Worth noting within this is the fact that nearly all of the sales were bank REO or distressed sales (something that wasn't mentioned in the article). These sales may represent the new market values for the area and very well may mark the bottom of the market in which case the value proposition for Tuhaye is very strong. Tuhaye has great views of Deer Valley though it is not necessarily part of what locals and Park City real estate professionals recognize as Deer Valley. This is not the first time that Park City and Deer Valley have been recognized as one of the world's best places to own a vacation home; the fact that this trend continues points to the fact that what makes this are desirable has not changed. Call the YouInParkCity.com Group of Keller Williams Park City Real Estate to discuss the current opportunities for home ownership in one of the best places to own a (first or) second home Deer Valley, Utah (888)968-4672. Posted in buyers, Park City Economy, Park City Real Estate Notes, Park City value | 0 Responses to "Deer Valley ranked #6 in Best Places for Second Homes"